As a member of the Republican Party, he had previously been a Congressman, Ambassador and Director of Central Intelligence. During his career in public service, he was known simply as George Bush; since 2001, he has often been referred to as "George H. W. Bush", "Bush 41", or "George Bush Sr." in order to distinguish him from his eldest son, George W. Bush, the 43rd President of the United States. A scion of the Bush family, he was born in Milton, Massachusetts, to Prescott Bush and Dorothy Walker Bush. Following the attack on Pearl Harbor on December 7, 1941, Bush postponed his university studies, enlisted in the U.S. Navy on his 18th birthday, and became the youngest aviator in the U.S. Navy at the time. He served until September 1945, then attended Yale University. Graduating in 1948, he moved his family to West Texas, where he entered the oil business and became a millionaire by the age of 40 in 1964. Soon after founding his own oil company, Bush became involved in politics. He was defeated in his first election, for the U.S.
Senate in 1964 but won election to the House of Representatives from Texas' 7th district in 1966. He was re-elected in 1968 and was defeated for election to the Senate again in 1970. In 1971, President Richard Nixon appointed Bush as Ambassador to the United Nations, and in 1973, Bush became the Chairman of the Republican National Committee. The following year, President Gerald Ford appointed Bush as the ambassador to China and later reassigned Bush to the position of Director of Central Intelligence. Bush ran for president in 1980 but was defeated in the Republican primary by Ronald Reagan. Reagan chose Bush as his running mate, and Bush became vice president after the Reagan–Bush ticket won the 1980 election. During his eight-year tenure as vice president, Bush headed administration task forces on deregulation and fighting the War on Drugs. In 1988, Bush ran a successful campaign to succeed Reagan as President, defeating Democratic opponent Michael Dukakis. Foreign policy drove the Bush presidency: military operations were conducted in Panama and the Persian Gulf; the Berlin Wall fell in 1989, and the Soviet Union dissolved two years later. Although the agreement was not ratified until after he left office, Bush also signed the North American Free Trade Agreement (NAFTA), which created a trade bloc consisting of the United States, Canada, and Mexico. Domestically, Bush reneged on a 1988 campaign promise and, after a struggle with Congress, signed an increase in taxes that Congress had passed. In the wake of a weak recovery from an economic recession, along with continuing budget deficits and the diminution of foreign politics as a major issue in a post-Cold War political climate, he lost the 1992 presidential election to Democrat Bill Clinton. Bush left office in 1993. His presidential library was dedicated in 1997, and he was active—often alongside Bill Clinton—in various humanitarian activities. With George W. Bush's victory in the 2000 presidential election, Bush and his son became the second father–son pair to serve as president, following John Adams and John Quincy Adams. Bush's second son, Jeb Bush, served as the 43rd Governor of Florida and sought the Republican presidential nomination in 2016. 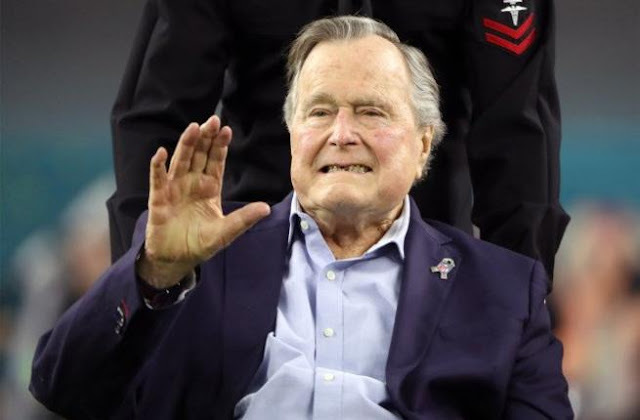 Bush died on November 30, 2018, at the age of 94. At the time of his death, Bush was the longest-lived American president in history, followed closely by Jimmy Carter, who was born a few months later.